At the 33rd PIANC World Congress in San Francisco, on 31 May 2014, the Annual General Assembly passed a resolution to form a task group on the ‘State and Perspectives of Waterborne Transport Infrastructure Worldwide’ (Appendix A). 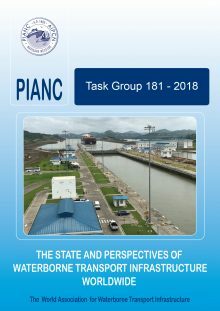 Task Group 181 was charged with gathering relevant information on the global needs for new or existing waterborne transport infrastructure, including investment levels and operation & maintenance costs as compared to other transport modes, and assimilating this information into a database that organises and presents it in a meaningful way. The Task Group was also charged with investigating emerging trends and new technologies affecting the development of waterborne transport infrastructure worldwide. Appendix B provides the October 2014 Terms of Reference (ToR) and the work plan for TG 181. TG 181’s final product is intended to provide guidance on best practices for better design, financing and construction of waterborne transport infrastructure, which can lead to a gain in productivity in infrastructure delivery.